As one of the most recognizable and powerful tech companies in world, Google has always prioritized bringing in fresh, new talent and hiring the best and brightest MBAs to help lead the next era of innovation at the company. According to a report published by Universum, Google was the most desired technology company by business students in the United States in 2018. 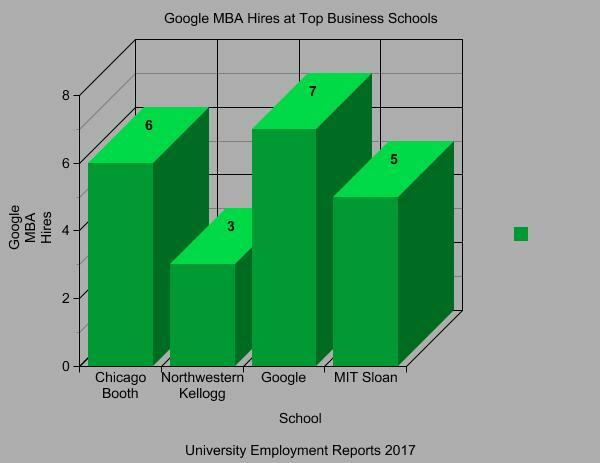 According to university employment reports, top schools the University of Chicago, Northwestern, MIT Sloan, and Columbia continue to produce much of Google’s MBA hires each year. Google looks for applicants who thrive in small, focused teams and high-energy environments. The company is also looking for buy-in, valuing individuals who are passionate about their work and their everyday lives. Hired MBAs work on projects tailored to their own strengths, often working in product management, sales, finance, marketing, and operations teams. As compensation, the company offers individually-tailored packages featuring competitive salaries, bonuses, and equity components. Benefits and perks ultimately vary by region and position. Anyone interested in working for Google can simply apply for a position, or even multiple positions at once. A hiring manager will review an applicant’s resume, as well as transcript for interns and new graduates, and determine which roles fits best. From there, chosen candidates will interview for the position. Don’t worry: Google has done away with their infamous brain teaser interviews. For students, both graduate and undergraduate, Google hosts numerous outreach events at schools across the world to highlight internship programs and opportunities for recent graduates. Interested students are encouraged check with their university’s careers center to see if a Google representative will be visiting. Perhaps the best way for an MBA to find full-time employment at Google is through the company’s numerous internship opportunities. According to Google, business interns come from all backgrounds and use their diverse skills sets to drive business and innovation. Candidates can visit the company’s students site to find and apply for these types of roles. Business internship applications are reviewed on a rolling basis. Interns are also well compensated: According to data collected by Glassdoor, the median monthly pay of Google interns is $6,000. To put that into perspective, the average full-time working American makes $51,350 a year, or $4279 per month before taxes. Interviews: December – April 2018, on a rolling basis. Students can find more resources from Google here, while more job information can be found here.